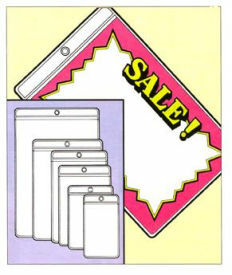 Heavy Duty Vinyl Sign Envelopes for Protection & Display. Made of heavy duty vinyl these envelopes protect tags, price cards, warranties, and product information. Display them on furniture, appliances, electronics, sporting goods, power tools and a wide range of other products. Envelopes have reinforced hanging holes and edges for durability. They are easy to use just attach them with tagging fasteners. They're open at the top, sealed on the bottom and sides, so information is easy to see and won't fall out.